Family:Part of the Araucariaceae family. Lighting: They prefer full sun but will survive in low lighting. Watering: Allow the soil to dry out between waterings because Araucaria plants do not like damp soil. Feeding: The Samsons recommend organic fertilizer in spring and autumn. Pruning and wiring: When pruning this plant you got to remember to just remove the tip which will include about three soft, needle-like leaves the same way you would go about bud pruning a Juniper. In a few weeks to a month, two new buds should take the place of the missing buds. If you pinch a bud wrong, new growth at the tip will cease. NIP's are one of those trees which you should practice bud pinching on several inexpensive practice plants first to develop an eye for pinching at just the right time. Propagation: From seed in spring germination would be a slow process and mostly is aided by the use of bottom heat. Cuttings may be taken from terminal shoots, not from laterals. Repotting: During every second year in spring,using fast-draining soil mix you most repot the planet. Pests and diseases: No pests or diseases are of major concern for this plant except scales, sooty mold, and leaf spots. The Norfolk Island pine is a large evergreen, which has a single upright trunk, tiered branching habit, and a narrow pyramidal or columnar shape. Eventually reaching a height of about 80 feet, the tree possesses a rapid growth rate. The tree would grow taller, but lightning frequently limits height growth in the eastern U.S. The dark green, 1/2-inch-long, individual leaves on young trees are lance late and look somewhat like spruce or fir needles at first glance. Mature leaves are somewhat contorted on twisted branches. Both leaf types appear on the tree at the same time. The trunk is often curved and swollen at the base and black. The large, spiny, 10 to 15-pound cones are rare in cultivation. 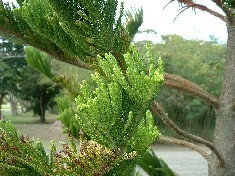 Male and female cones are usually found on separate plants. They are native to South America and some Pacific islands. The Monkey-Puzzle tree, also an Araucaria, is a large, bizarre evergreen, 60 to 70 feet tall and 30 to 35 feet wide, which forms a loose, see-through, pyramidal shape with a straight trunk. The tree is so open in habit you could almost look at it and not see it. The leaves are dark green, stiff, with sharp needles densely arranged on horizontal, irregular, upwardly sweeping branches. 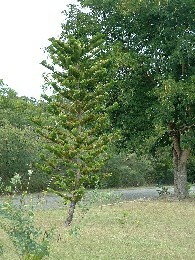 Monkey-Puzzle tree makes an attractive, novelty specimen for a large, open yard or commercial landscape. It is normally planted only as an oddity someplace in the rear of a landscape out of view from most passers-by but could be the specimen feature in a large oriental landscape. Trees have many economic uses. Lumber from trees is the most widely used material in the building of homes and other structures. Many trees yield edible fruits and nuts such as oranges, grapefruits, apples, avocados, peaches, pecans, hickory nuts, and almonds. Trees and their fruits are also the source of many commercial waxes and oils, including olive oil and coconut oil. Tree trunks are tapped for sap, which is used in making such products as maple syrup, rubber, and turpentine. The barks of certain trees are sources of cork and spices. Many trees yield important medicines, such as quinine. The bark of the yew tree is the source of the drug taxol, which in 1992 was approved for treating ovarian cancer. Chemical materials produced by trees are used in tanning leather and in the manufacture of inks, medicines, dyes, and wood alcohol. In addition, trees are used in landscaping homes, parks, and highways. In regions with extreme climates, they serve as windbreaks or as shade against the sun.